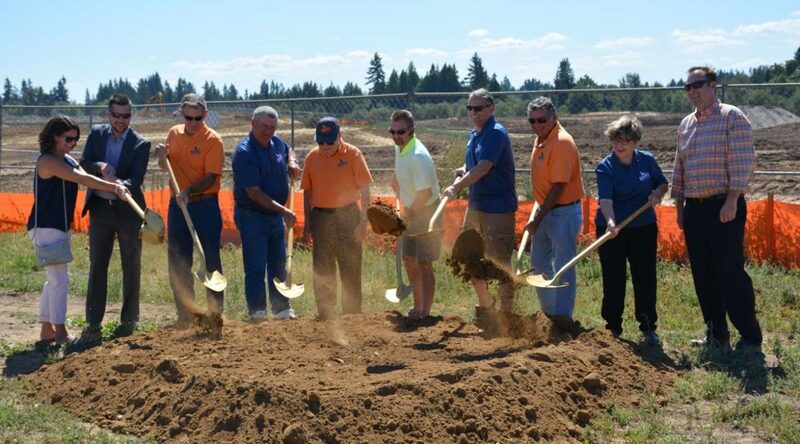 The field off of Hillhurst Road was filled with more than just dirt, though turning of said dirt was the reason for the occasion as the Ridgefield Outdoor Recreation Complex (the RORC) officially broke ground Aug. 31. City, school and regional officials along with city residents gathered for the occasion while construction crews were already hard at work on what would become a sizeable development benefitting the city. The groundbreaking was specifically for the RORC, one piece of a larger puzzle involving both school and city. The RORC will sit adjacent to the Ridgefield School District’s new campus for intermediate grades, currently under construction. The building work had its own groundbreaking May 1, and the foundation was clearly visible from last week’s event space. It was through a partnership between the city and the district that both projects came about, and with some notable efficiencies. Initially the RORC and school campus were going in together anyway through an agreement that RSD Superintendent Nathan McCann has previously said will save the district more than $5 million. What’s more, work on getting the land ready for building got some significant savings as the bid for the grading of the site was more than $700,000 below engineer’s estimates. Previously, Ridgefield Public Works Director Bryan Kast said it was due to the winning company, Tapani Underground, already having their construction units near the site, just next door working on grading for the school. Once they wrapped on the school building all they had to do was move over and start grading the park. Overall the RORC will cost roughly $20 million, Kast said, paid out through a number of avenues including impact fees and a council-approved bond that will not increase property taxes. Ridgefield Mayor Ron Onslow kicked off the ceremony, and though he did turn some dirt it wasn’t quite in the fashion he initially wanted. “I did not want to do a shovel, I wanted to drive one of those big tractors but they didn’t let me,” Onslow remarked, acknowledging the large vehicles moving in the background. A big theme of the RORC, and the school campus project as well, is how the partnership has allowed more to come from the limited resources each entity had by itself. “The partnership with the school allowed us to do more than we could have done separately,” Onslow said. McCann also acknowledged the “funky math” of the partnership, where one plus one equalled more than two. “I’m so grateful to live and work in a community where this kind of work is encouraged and supported,” McCann said. The school district’s side of the partnership came about thanks to the voters in the district, as a $78 million bond handily passed with a supermajority of nearly 69 percent in February. “Right now, we’re looking at a bunch of dirt,” Ridgefield City Manager Steve Stuart said. He talked about the future facility “through the eyes of the people that would be using it,” including students heading to the brand-new school building, parents who will benefit from safer, better-designed circulation for dropoffs and pickups, coaches who will be “actually able to set the lineup, instead of the (field) lines” thanks to turf fields as well as volunteers who can benefit from the commercial-grade kitchen. “The moment we want, the moment we expect is when they walk on that field, the only word would be ‘wow,’” Stuart said. From the public works side, Kast was excited to see the project finally underway. “We’ve been working on it for almost two years now, and to actually see the equipment moving on-site is a good feeling,” Kast said. Though exciting Kast said it would be important to “keep noses to the grindstone” as the clock was running toward the planned opening date of the start of the 2018-2019 school year. Grading and utility work will wrap up likely at the end of the year, Kast said, with the above-ground improvements going out to bid at the start of 2018. “This time next year, there will be some fields here,” Kast said.